EarthBound is an RPG for the SNES. It had good success in Japan as Mother 2 and Nintendo ported it to the US with a big advertising campaign, but failed to sell as well as in Japan. 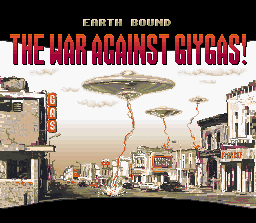 Later, in Japan, it was re-released on the Game Boy Advance along with Mother (the first game) as Mother 1+2. On April 20, 2006 Mother 3 was released in Japan on GBA. The game is often dubbed a "sequel" to the original Mother, an NES title released only in Japan. In practice, however, the games largely exist as "stand alone" titles, with similar themes and storylines, but little plot or character continuity. This page has been accessed 103,521 times.